Are snakes evil? I don’t know. Are snakes cool? Yes they are. What's the coolest snake? Well, probably , the massive prehistoric constrictor Titanoboa, the biggest snake ever known to exist. Before I get into stats on this monster Ill put it this way, if Godzilla, Chuck Norris, or perhaps The Most Interesting Man in the World is walking around the park with his shirt off and a snake around his neck it would be a Titanoboa. The Titanoboa lived 65 million years ago, in South America. The remains were found in a coal mine that was once a very hot, tropical swamp and rainforest. The Titanoboa stretched a very respectable 48 ft (14.6m) and weighed approximately 2500 pounds (1136kg). It could and would easily eat any human if it was alive today, and it would have no natural predators. 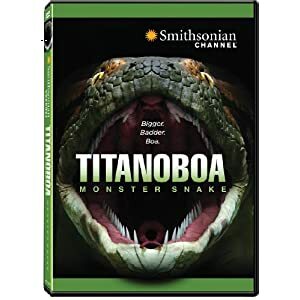 I can't think of any creature alive today that would be able to take on all 48 feet of the Titanoboa. 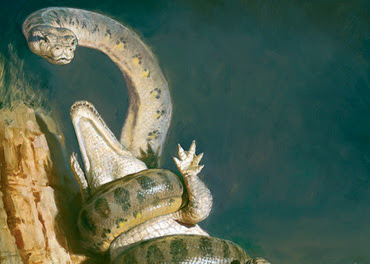 Check out the awesome video below of a hypothetical fight between Titanoboa and a T-Rex below.